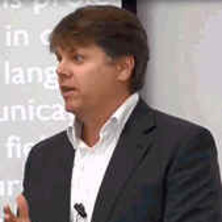 Paul Moore is a lecturer in the postgraduate Applied Linguistics program in The School of Languages and Cultures. Paul’s main research interest involves the dynamic influence of learners, tasks and sociocultural context on task-based interaction, performance and development. Recent projects have included sociocognitive interpretations of language test performance, language policy in higher education, and the intersection between language and intercultural communication. Lu, Shanshan and Moore, Paul (2018) Western-trained Chinese EFL teachers' reflections on Communicative Language Teaching. Asian EFL Journal, 20 6: 10-32. CULTURE, TECHNOLOGY, PEDAGOGY AND CONTEXT KNOWLEDGE IN EFL EDUCATION: WHAT CHILEAN EFL TEACHERS KNOW, DO, MAKE AND USE. Levy, Mike and Moore, Paul J. (2017). Language and technology: theory and practice, options and issues in computer-assisted language learning. In Jeong-Bae Son and Scott Windeatt (Ed. ), Language teacher education and technology: approaches and practices (pp. 19-34) London, United Kingdom: Bloomsbury Academic. Moore, Paul (2012). Incidental learner-generated focus on form in a task-based EFL classroom. In Ali Shehadeh and Christine A. Coombe (Ed. ), Task-based language teaching in foreign language contexts: research and implementation (pp. 163-185) Amsterdam, The Netherlands: John Bemjamins Publishing Company. Moore, Paul J. (2012) Supporting the language and learning development of EAL students in Australian higher education. SiSAL Journal, 3 2: 182-195. Moore, Paul (2009) Case study research in applied linguistics. Prospect Journal of Applied Linguistics, 24 3: 61-62. Shaw, Julie, Moore, Paul and Gandhidasan, Senthilkumar (2007) Educational acculturation and academic integrity: outcomes of an intervention subject for international post-graduate public health students. Journal of Academic Language and Learning, 1 1: 55-67. Shimada, Noriko and Moore, Paul (2014). Japanese heritage language learners and the NSW high school curriculum: eligibility and other hurdles. In: Matthew Todd and Elicia O'Reilly, National Symposium of Japanese Language Education Proceedings: 2012 Creating the Future. 1st National Symposium of Japanese Language Education, Melbourne, Australia, (119-128). 1-2 November 2012. Chatterjee, Meeta and Moore, Paul (2009). Issues of inclusivity for online distance learners: An academic learning support perspective. In: Brian Martin, Proceedings of the Fourth Asia-Pacific Conference on Educational Integrity (4APCEI). 4th Asia Pacific Conference on Educational Integrity (4APCEI), University of Wollongong, NSW, (). 28-30 September 2009.